Brass Spot On Sundials are hand cast out of solid brass, and designed to be used outdoors for years to come. Over time the brass will turn into a dull brown finish. if you wish to clean your sundial, gently wash with a soft cloth and soapy water, ensuring not to use any abrasives. The Spot-On Sundial requires very little maintenance. 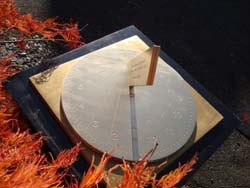 It will weather naturally; the shine of the brass will be replaced by the matt surface of an oxide layer, which will protect the metal of the sundial, and will also give greater contrast to show the shadow of the gnomon, and the line of light at solar noon. If you have trouble with bird droppings etc, we recommend that you use a soft cloth and hot water. Do not use any scouring powder or abrasive. If necessary, use a small amount of liquid detergent, but it is best to use hot water alone. Lighter fluid - gently rub some lighter fluid with a soft cloth over the finish. Lemon juice - gently rub some lemon juice over the finish with a soft damp cloth. Generally, it is best to let nature clean the dial and take its course, cleaning by rainwater and ageing normally, which is the best course to ensure many years of use. If spare parts are needed please visit our spare parts page.